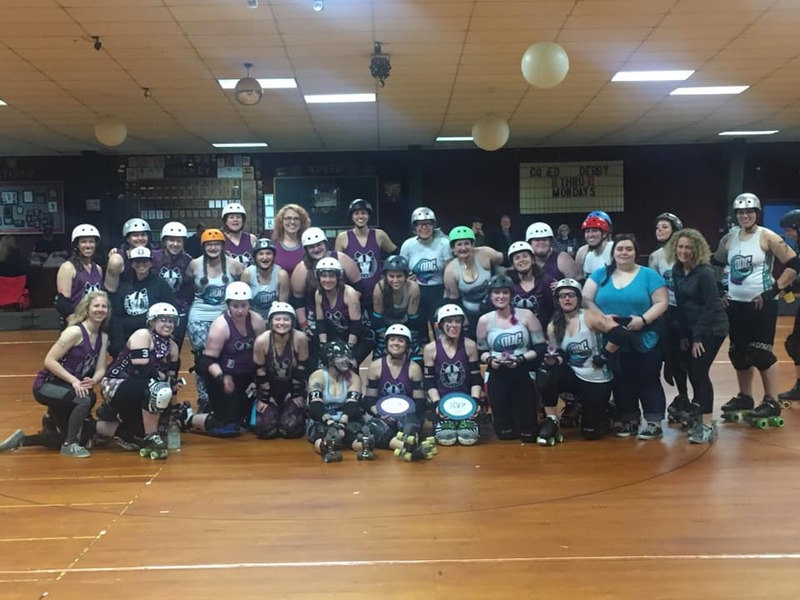 Rodeo City Rollergirls – Ellensburg's own women's flat track roller derby league! 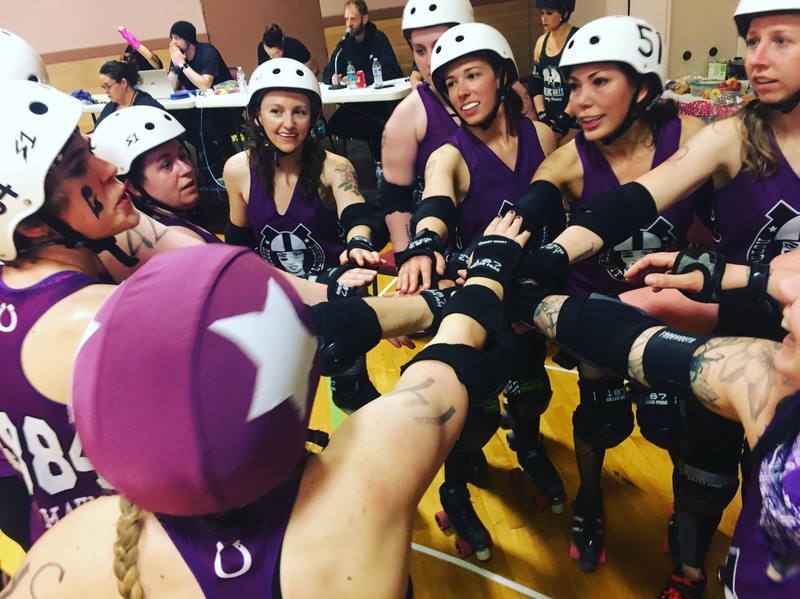 The Rodeo City Rollergirls took a 205-192 win on Saturday in Bremerton against Northwest Derby Company. At halftime the score was 114 to 109 with Rodeo down five points. The team rallied in the second half and took a small lead that they maintained throughout the remainder of the bout. 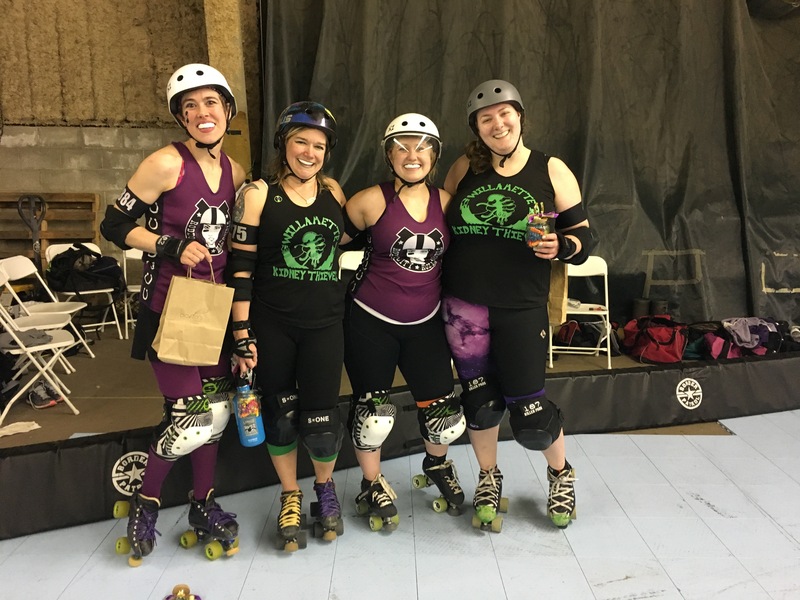 Rodeo City’s Hula C Nation, Shelby Taylor-Olson, took the MVP Blocker award, and YoYo Mauler, Callie Guntheroth took the MVP Jammer award. 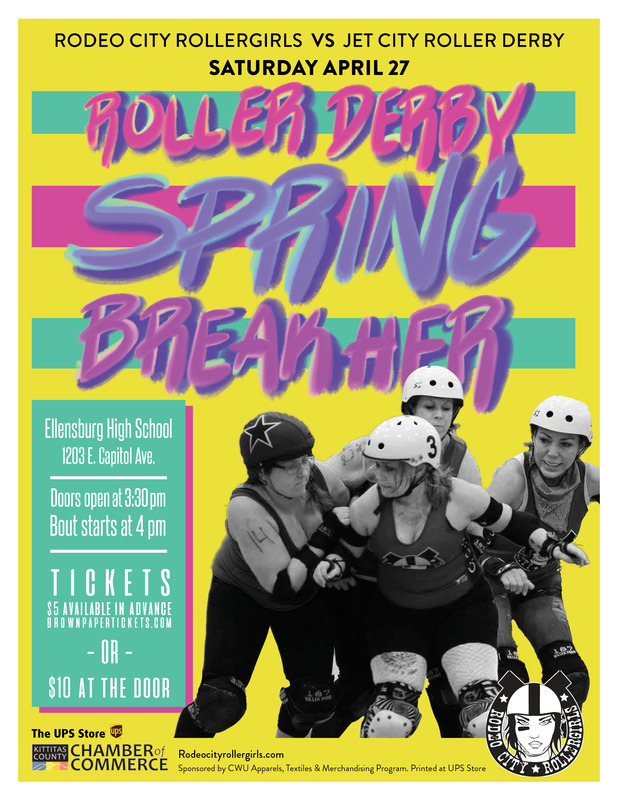 The Rodeo City Rollergirls play next at 4 p.m. April 27 at Ellensburg High School against Jet City Roller Derby. Doors open at 3:30 p.m. Tickets are $5 online or $10 at the door. Learn more about www.rodeocityrollergirls.com. The Rodeo City Rollergirls will take on Jet City Roller Derby at our next home bout on Saturday, April 27th at Ellensburg High School. Doors open at 3:30 p.m. and the bout starts at 4 p.m. Tickets are $5 online in advance or $10 at the door. Children under 5 are free. The afterparty will be at The Pearl Bar & Grill, located at 402 N. Pearl St., starting around 6 p.m. The venue is family friendly until 8 p.m.
Tickets are available online now! 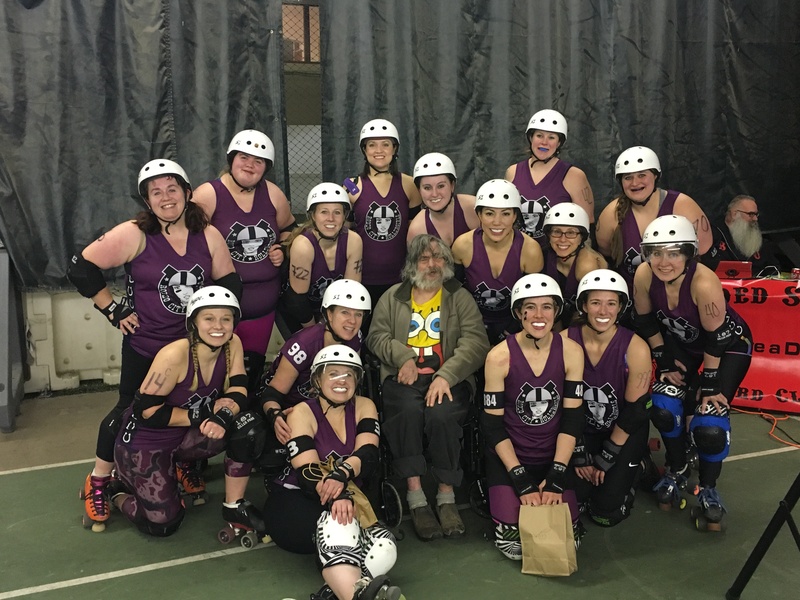 The Rodeo City Rollergirls took a 205-92 win over the Palouse River Rampage on Saturday, March 23rd at the Gladish Community and Cultural Center in Pullman. 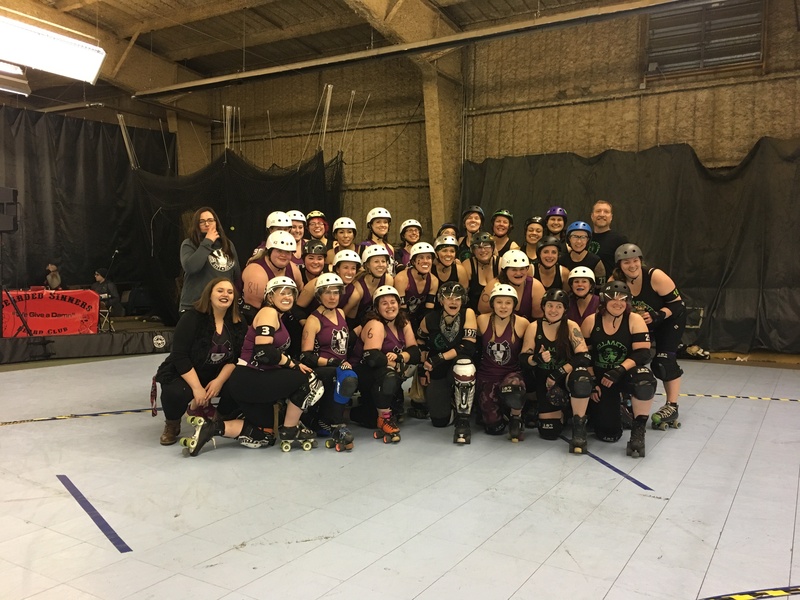 The Rodeo City Rollergirls debuted new skater April Rohrbach who recently graduated the fresh meat program. She primarily played the blocker position, but also was successful when she jammed. 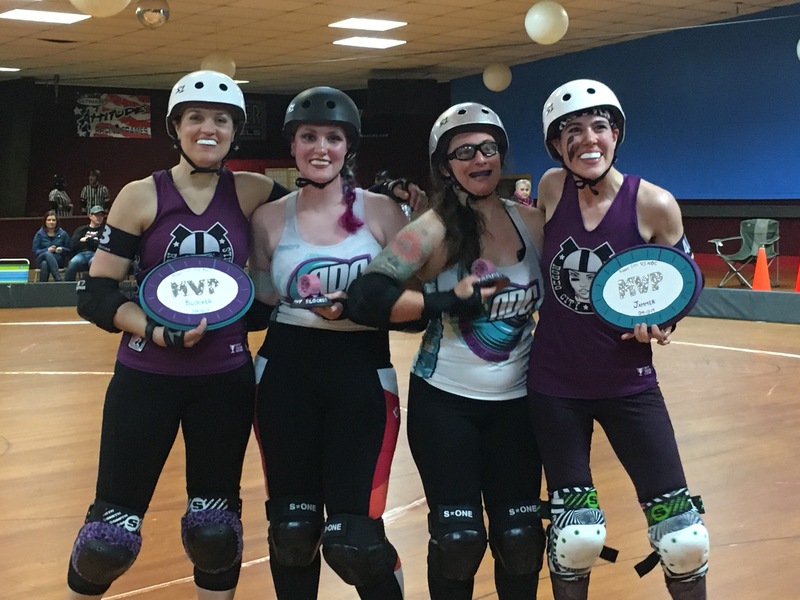 Rodeo’s MVP Jammer was What The Hellvetica and MVP Blocker was Master Bouter. The Rodeo City Rollergirls are 7-1 in season 9. 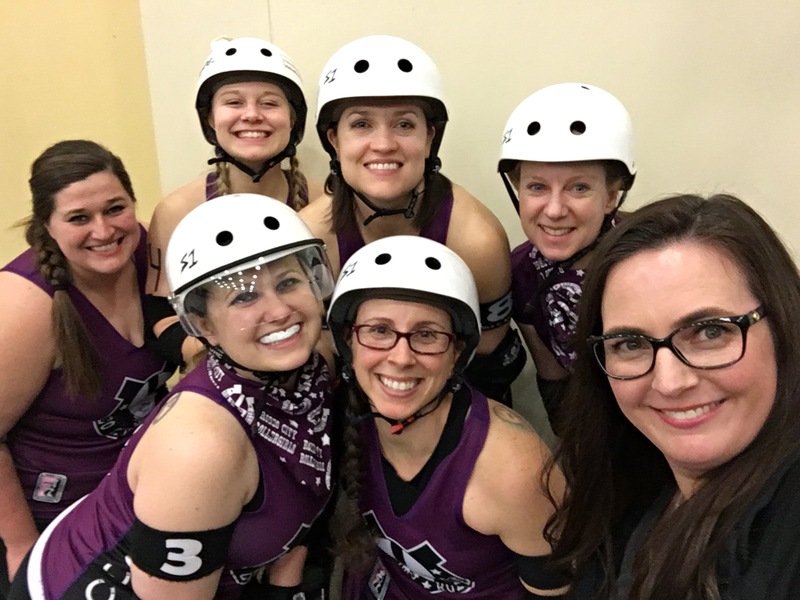 The team plays next on April 13 in Kitsap County as they take on Northwest Derby Company. For more information about joining us email freshmeat@rodeocityrollergirls.com. We’re hitting the road on Saturday, March 23rd to take on the Palouse River Rampage in Pullman. Come cheer us on at the Gladish Community Center Gym, 115 NW State St, Pullman, WA 99163. Doors open at 4:30 p.m. Tickets $10 at the door. The Rodeo City Rollergirls took a 143-107 win over the Rolling Hills Derby Dames on Saturday, March 9th at Ellensburg High School. Rodeo’s team captain Hailey McGraw, known as What The Hellvetica, said her team started out with the fundamentals and worked together to focus on teamwork within their walls. Rodeo coach Andrea Eklund said it was a hard-fought game. Rodeo is 6-1 in the 2018-2019 season. McGraw was named Rodeo’s MVP jammer, and Rumble Bee Marie, Brigitte Wiegand, was named MVP blocker. The Rodeo City Rollergirls play next on March 23 in Pullman where they will take on the Palouse River Rollers. 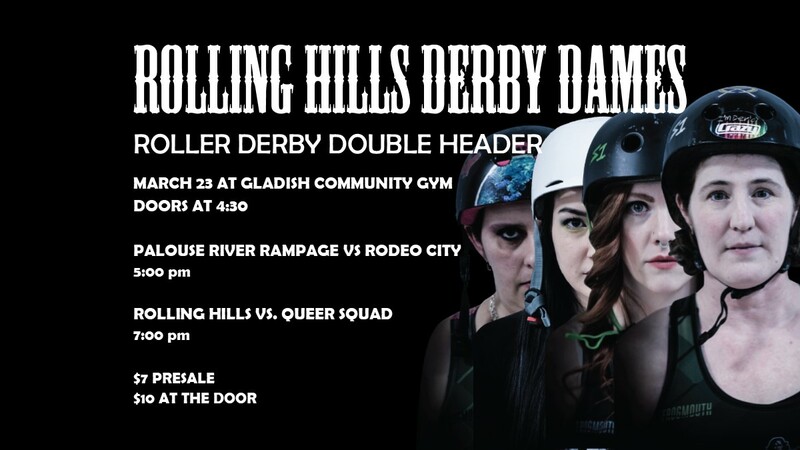 The Rodeo City Rollergirls will take on the Rolling Hills Derby Dames, and the Rodeo City Junior Rollers will take on Rose City Junior Derby in this doubleheader event! 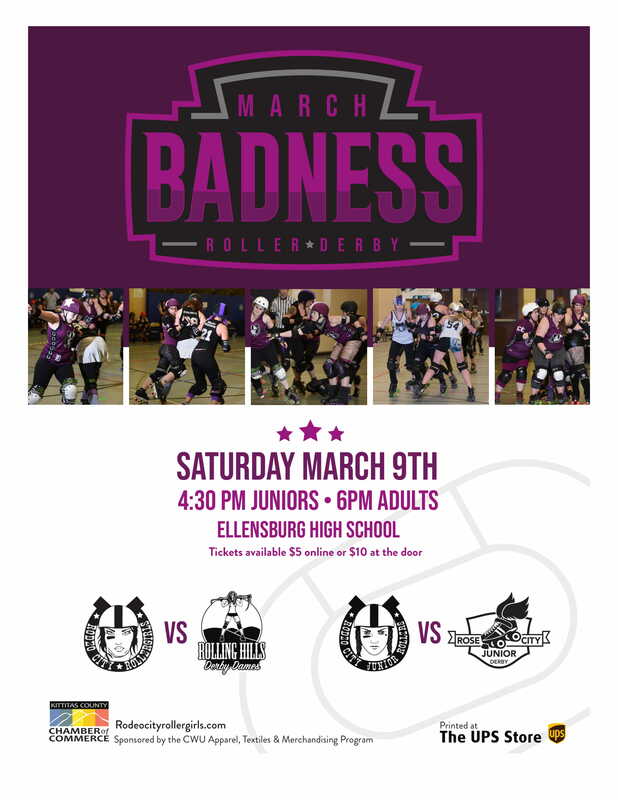 The action starts at 4:30 p.m. Saturday, March 9th Ellensburg High School with the juniors game. The adults will play following the juniors, around 6 p.m. Doors open at 4:00 p.m. and the first bout starts at 4:30 p.m. Tickets are $5 online in advance or $10 at the door. Children under 5 are free. The afterparty will be at The Red Pickle, located at 301 N. Pine St. around 8 p.m.
Poster designed by Penalty Box Stickers. 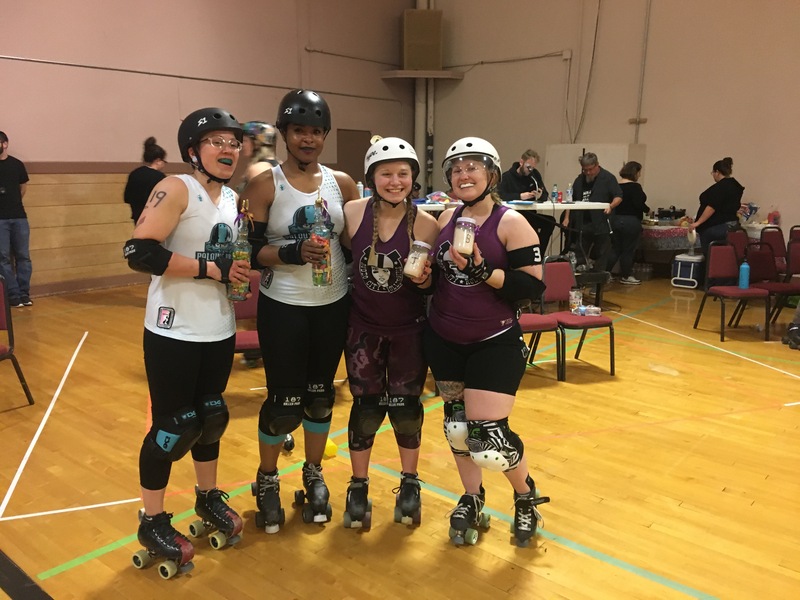 The Willamette Kidney Thieves took a 165-130 win over the Rodeo City Rollergirls on Saturday, February 23rd in Ellensburg. Rodeo’s Coach, Professor Pain, said she was proud of the team’s effort. Saturday also marked the first time Rodeo used the new track that was purchased in 2018. Rodeo’s MVP jammer was YoYo Mauler and MVP blocker was Master Bouter. Rodeo is now 5-1 in the 2018-2019 season. We play next at home on Saturday, March 9th against the Rolling Hills Derby Dames. More info coming soon! A photo with our superfan, Joel! Save the date for Sunday, January 27th! We’re hosting a new skater bout/black and white scrimmage for new skaters who have just graduated fresh meat, have been skating less than 2 years or are returning from injury. It’s a lower level learning opportunity! Free to the public to watch. $5 skater fee. 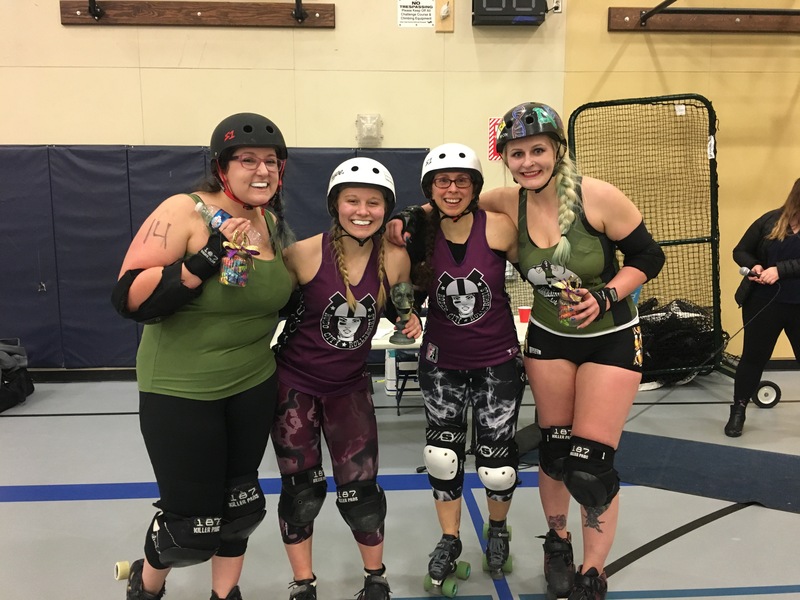 Ellensburg, WA (December 2, 2018) – The Rodeo City Rollergirls took a 206-96 win over the Aftershocks Roller Rebels on Sunday at Ellensburg High School in their first home bout of their ninth season. Rodeo is 3-0 in the 2018-2019 season with wins over roller derby teams from Kennewick and Moses Lake. Rodeo’s team captain Hailey McGraw, known as What The Hellvetica, was proud of the way her team played. The Women’s Flat Track Derby Association released some rule changes that will go into effect in January 2019, but some teams have opted to already incorporate them. Rodeo’s public relations officer, Nicole Klauss, said this bout was also a food drive for the FISH Food Bank. In lieu of entry people donated nonperishable food items. At least ten boxes of items were collected but the total weight of the donations was not immediately known. Rodeo City’s Yo-Yo Mauler, Callie Guntheroth, took the MVP jammer award, while Kelsassination, Kelsey Chappelle, took the MVP Blocker award. 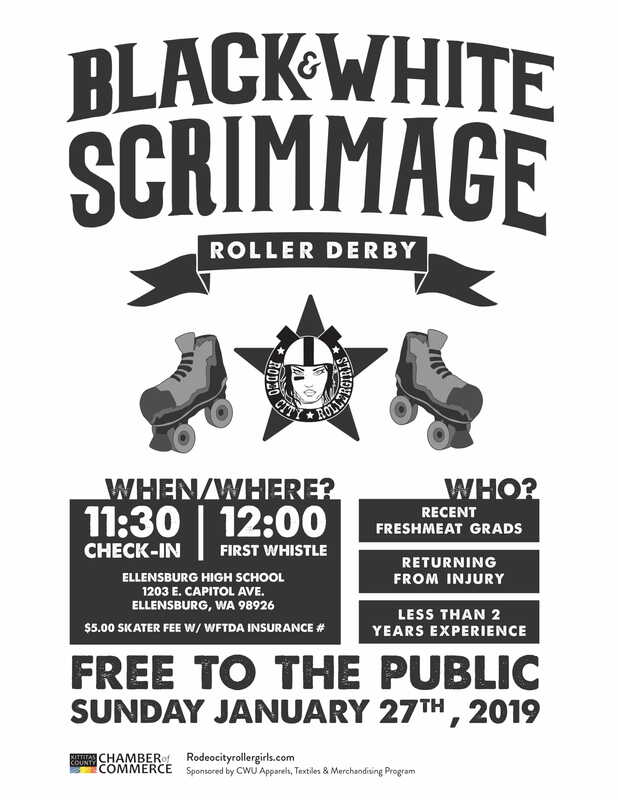 The Rodeo City Rollergirls will host a new skater bout at noon January 27, 2019 at Ellensburg High School. 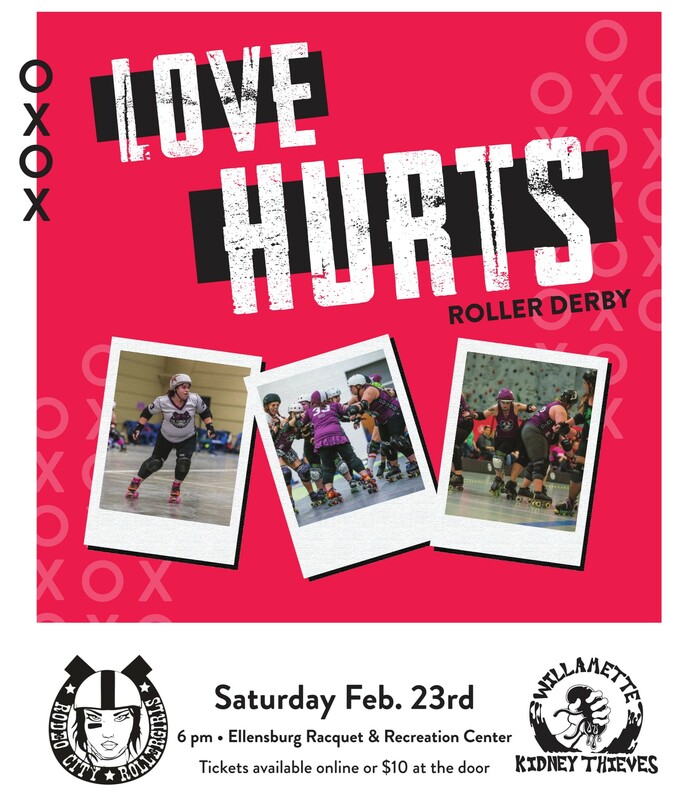 The bout will feature newly graduated fresh meat from Ellensburg and from around the region, along with skaters who are still in their first year or returning from injury.